Stock prices have been on a run...for the last 90 years. The last five years have been pretty good too. If you believe everything that you hear, you probably think we're in for zero or negative returns going forward, or an epic stock market decline, or both. Because we cannot precisely forecast future returns or the next bear market, these things are always possible if unlikely. But there is nothing about today that makes the odds any different or higher. A diversified stock portfolio has returned +12.9% per year over the last five years through the end of 2017. Does that sound "high?" If so, you don't know market history (it's OK, almost no one does). From 1970-2012 (longest period available, up to the last five years), a globally-diversified stock index portfolio returned +13.8% per year. So the last five years were actually a percent below the long-term average. As the graphic above shows, the average of all five-year periods has been +14.5% per year. But it's not 14.5% over every five-year period, it has ranged from +34.2% to -5.6% per year. That spread is wide, but you don't need an HP 12C to figure that about +13% a year is comfortably in the middle. I wouldn't bet on +13% annualized gains over the next five years, let alone almost 15%. But ultra-low returns are just as extreme in the opposite direction. More than likely, returns will be decent and come more from overseas stocks and small value companies compared to the US and large-cap dominance of more recent years. 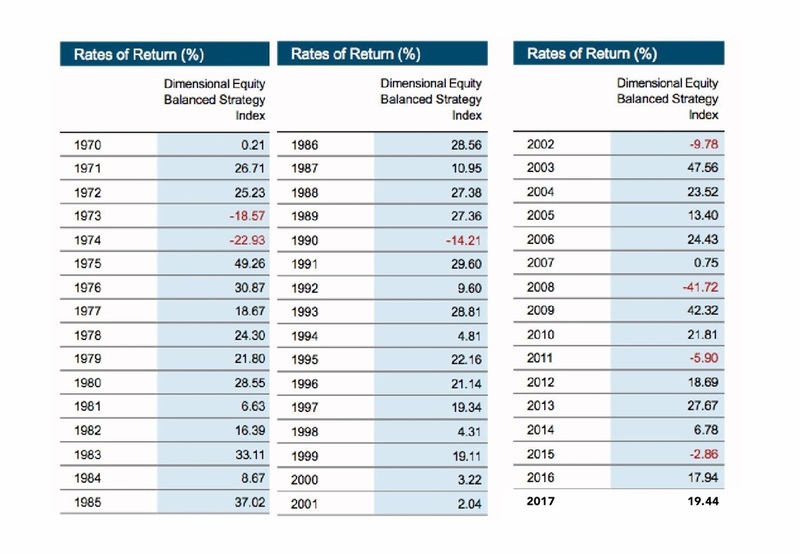 To become more familiar with the long-term returns on a diversified stock portfolio, the image below lists year-by-year index returns from 1970 through 2017. My guess is they are a lot higher, and positive a lot more frequently than you assumed? There are a few brutal bear markets in there of course, but most of the time returns are more like the last five years. Recent results aren't an anomaly, this is what diversified stock portfolios do. *details of the components of the Dimensional Equity Balanced Strategy Index available upon request.